Alright. Got behind and it took me the afternoon, but... duh duh duh DUH!!! Here are the simple instructions for how to make the simple finish I used. 1. You'll need 16 white jelly roll strips for the long sashing strips. Sew them together in pairs so that you have 8 long white strips (80" long). 2. From each end of the long strip, cut 10". That will be 16 pieces (these will be used for the short sashing pieces). 3. From one more white jelly roll strip, cut 4 more 10" pieces. 4. 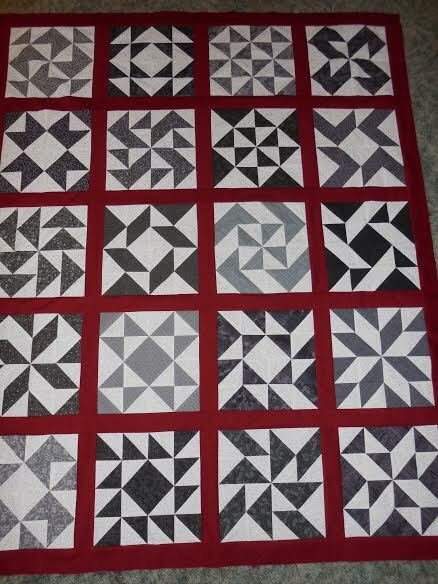 For blocks 1-4, 6-9, 11-14, 16-19, and 21-14, attach a 10" piece of short sashing, and then trim the 10" piece down to fit your block. The sashing will be set to the right in the next step. 5. Attach blocks 1-4, 6-9, 11-14, 16-19, and 21-14 together in rows. 6. Add the end blocks (5, 10, 15, 20, 25) to each row. 7. Add long sashing to the bottom of each row. Match up the seam in the sashing to the middle seam in your middle block. You'll have extra on each end; trim off. 8. Attach rows to each other. 9. 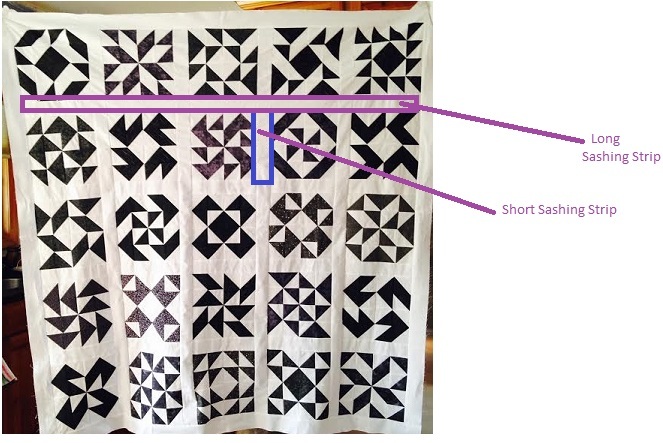 Add a sashing strip to the top of your quilt top, and then to each side. I'll make a separate post once I get pictures in of finished tops. Thanks for an amazing HST Challenge, everyone! I'm glad we did it. I can guarantee you I wouldn't have a finished quilt top if it weren't for us all keeping each other on schedule. I can't wait to see all of yours! Send them to me at jellyrollfabrics@gmail.com! And now for the parade of HST quilts! 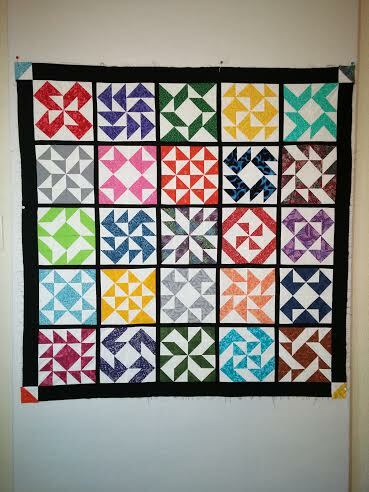 Trude's version - she framed each block in addition to sashing! Kathy's sister took part, too. Here's hers! And so did her other sister! 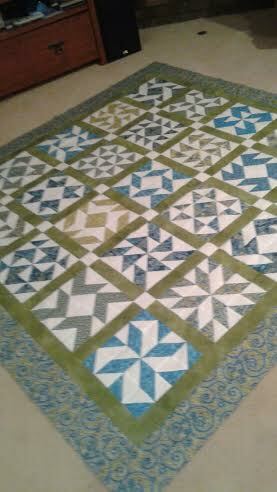 And her finished quilt with binding! Ann A's version and her backing fabric! Look at what Teresa made with her extras! Everyone did an absolutely AMAZING job. 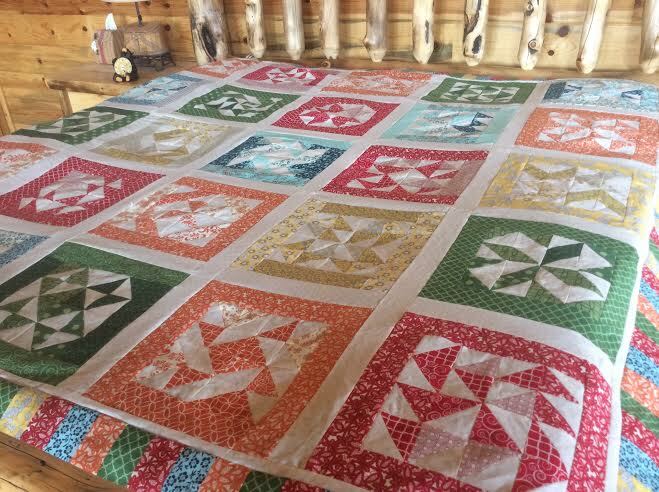 Just look at all these gorgeous quilts!! I couldn't be more thrilled with how all of them turned out. Much ooh-ing and ahh-ing as they came into my email box. And I adore mine! I hope everyone had fun, and I'll update this page as more folks get their tops done! :D Thanks for a wonderful challenge! Hi Liz, Thank you for taking the time to offer this challenge. Looked forward to each Saturday to see the next block design. Now to decide if I want white sashing or another color since I did all mine in white and another color. Don't you mean blocks 21 - 24 in lines No 5 & 6? NOT 21 - 14 You have got to be brain dead after getting this all done today. Thanks a bunch - I LOVE it. Can't wait till the next one - but I'm sure your in no hurry - go relax. Don't you have the short sashing and long sashing strips reversed in your photo instructions? Looks to me that the short sashing's are horizontal between rows and the long sashing's run vertical between rows. maybe you were in too big of a hurry!! Looks fantastic Liz!! I'm working on putting mine together now. Thank you again for challenging us and all your hard work!! Thank you, Liz, for a lovely tutorial. 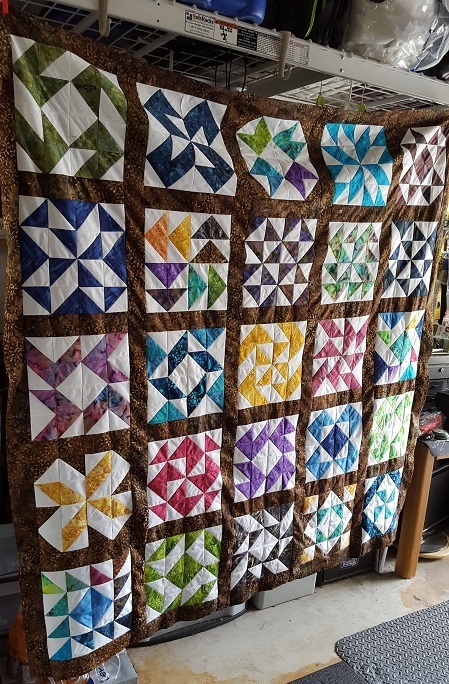 This type of endeavor takes quite a bit of time and effort, and your willingness to do so for quilters -- and free of charge -- is much appreciated! Linda Schipper...I see what you mean...but the problem is she has the quilt hanging on the design wall wrong. It needs turned to the right one turn and then the No 1 block will be in the upper left corner where it belongs instead of the bottom left corner. Then she could draw her lines. We all know she has to be dog tired and what a stress to committ to having it all done by a specific date. Thanks over and over for all the hard work. This HST Challenge has been exciting, fun and educational. I would've never attempted some of these blocks, but with your teaching and encouragement, it happened. Love doing this and thank you, Liz, for the time you put in this! So she turned the quilt sideways when photographing it!!! Get real people. 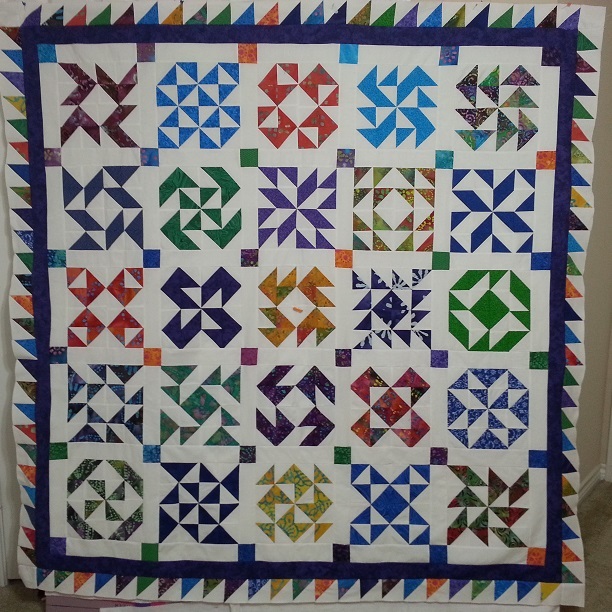 This was an awesome undertaking and ,as a quilt teacher myself, I know just how much work went into this. Apart from putting it all online for free. Great work Liz, a lot of my students participated. 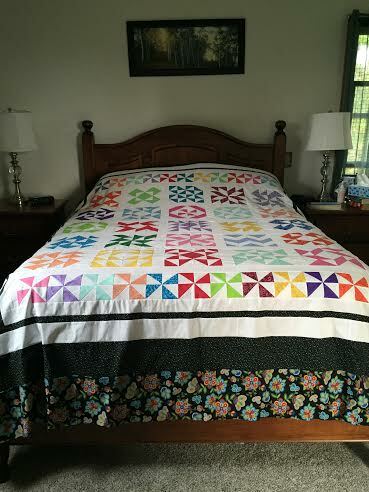 I just wanted you to know...everyone that has seen my quilt, loves it! 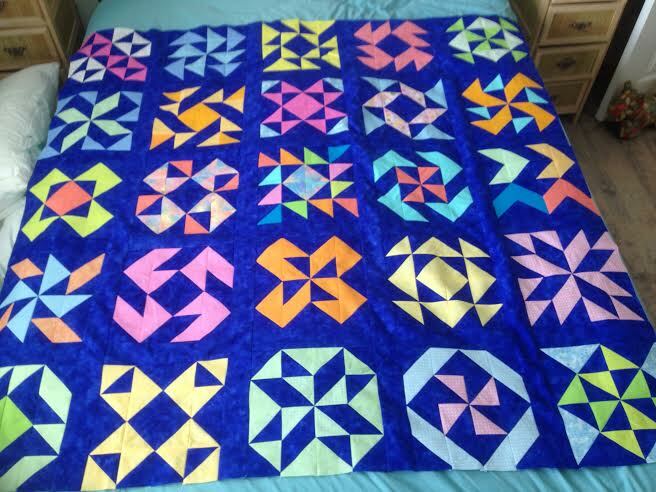 I've sent links to this page to everyone along with an image of my quilt. You're truly THE BEST!, Liz! Wonderful and fun tutorials! Pat & Linda & Shirley - exactly right!! I do have it turned wrong in the picture. I'll improve this post in the next couple of days - hopefully it's enough so that people that want to get on finishing theirs can. My 3rd row also got sewn in flipped upside down but I COULD NOT DEAL with seam ripping it, so there it'll stay! hahahahaha!! Everyone thanks so much!! 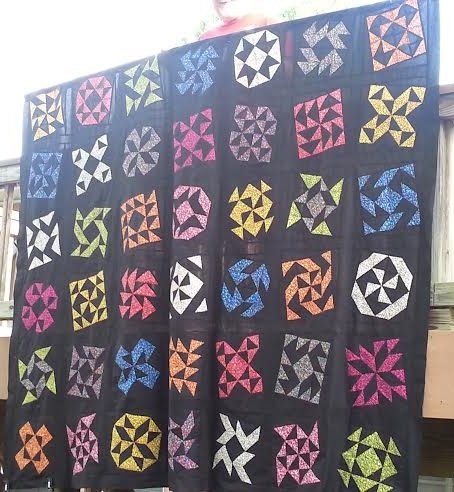 Can someone please tell me how much fabric this quilt takes to make? Liz, This was a very fun project. Thank you . Thank you so much, Liz, for all of this hard work ! I started late, but soon caught up, and then had the HST all ready to go on Saturday. I passed your website on to some classmates in a BOM class and they were excited about it too. I will watch to see what else you may come up with after you rest for a while. I may be making more of these blocks as several of my 9 grandchildren are interested. Peace be with you and yours. Hi Kelly! You'll need a minimum of 42 white or background color strips and and 25 color strips for the blocks and sashing. Binding will be another 6-7. Our original HST bundle had 3 white rolls and 2 color rolls. This has been so much fun, interesting and educational. I hate triangle but with HST they have made them easier to do. After we made the first block I had all my HST done and just waiting for the next week end. My third row got a little turn around. But that's ok this is my quilt. Just like you said still looks good. Thank you for all your hard work and your inspiration. This has been great fun. Picture will come. 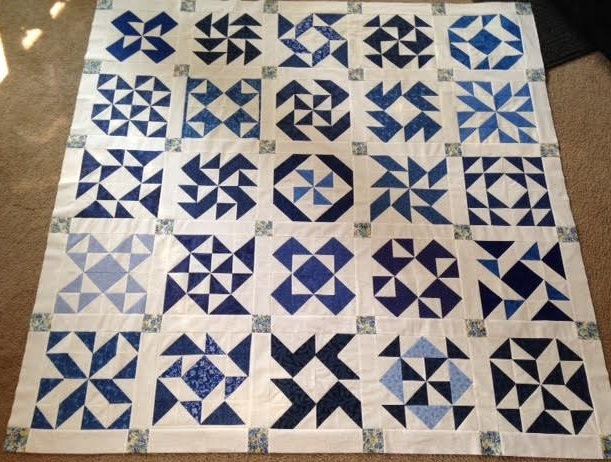 I'm interested to hear ideas and suggestions for long arm quilting this quilt! 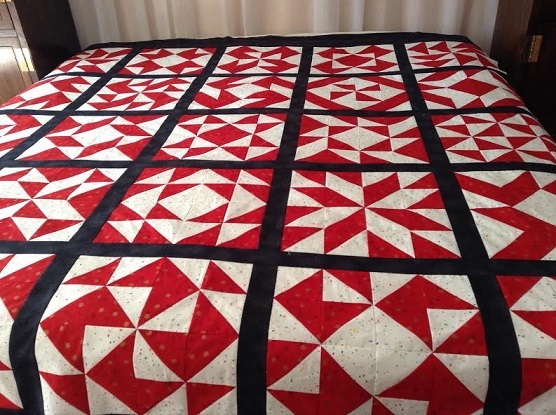 How are you going to finish this quilt? Any ideas would be greatly appreciated! Thanks once again to Liz for a wonderful experience...I sure love the end result! Liz, thank you for a fun quilt along! I can't wait to see everyone's finished top. 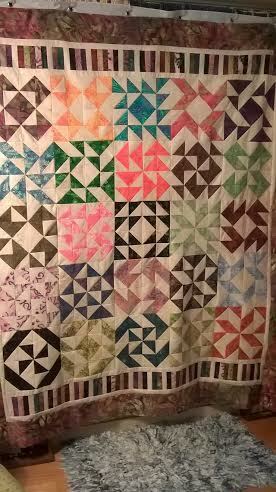 I'm glad I did this, but after 2 quilts, I hope I don't see any more HST for awhile HAHA. 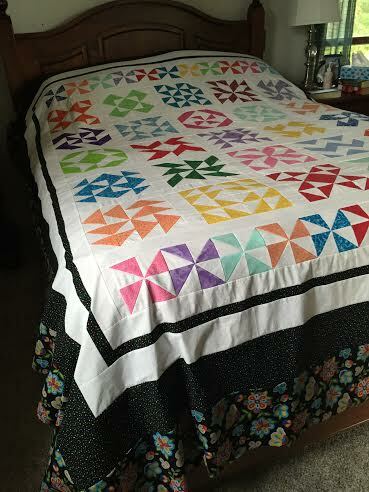 I used my leftovers to make a border for the top and bottom of my quilts. Just cut 'em down to a smaller size (2.5 inch)and lined 'em up. 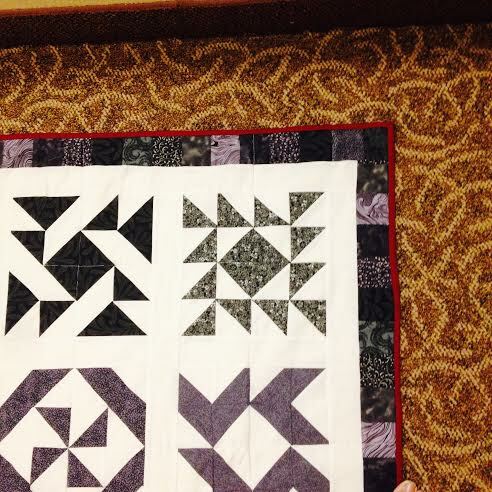 My quilt was 55.5 inches square before borders, and 59.5x66.5 after borders. What size did everyone else get? 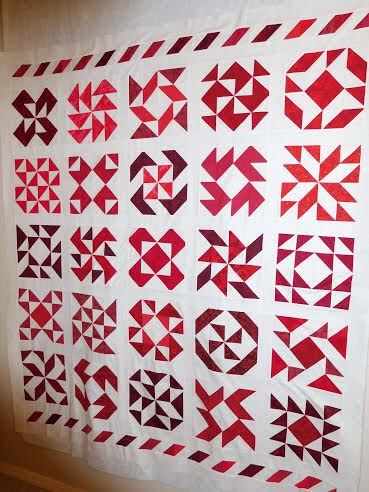 For quilting, I'd like something big and swirly/loopy from edge to edge, since the HST are so angular. Liz, I loved the quilt along. Thank you! With 25 white backgrounds and 25 black, I think I'll do a checkerboard layout. However, I have to finish working on my granddaughter's wedding dress and great granddaughter's dress first, even though I'm anxious to put it together. Liz....love the blocks but still waiting for the promised pictures to give me some idea with scrappy blocks. 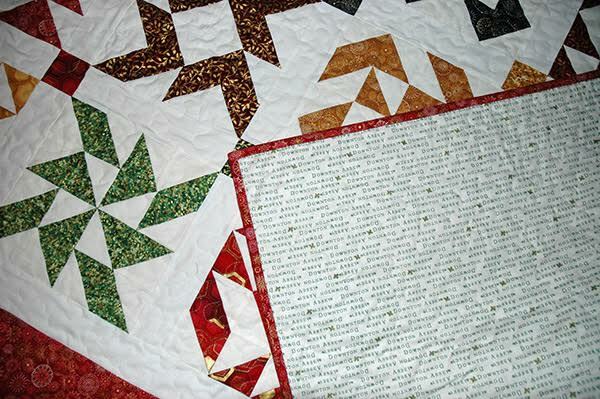 There were so many beautiful pictures of the blocks I'd love to see how they joined them and quilted them. Thanks...as we continue to wait for pictures. Or maybe I am not looking in the right place. Liz, Thank you !! I had a blast !! I would get so excited for Saturday morning to see the new block !! Unfortunately mine is still on the design wall !! :( I can't figure out what color sashing to use !! I'll send you a pic and maybe you can help or all of you !! Hi Liz! 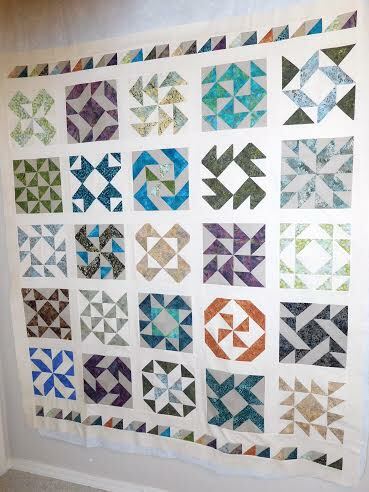 Did I miss the pictures of finished quilt tops from the HST Challenge? You did a fantastic job on this challenge. I think we all know why most challenges have only 1 block per MONTH now ...Thank you! I hope you are still planning on posting pictures so we can finish our beautifl quilts. Thanks Liz. Thank you so much for the wonderful tutorial!!! I' ve just finished my top. It has been so much fun to do it. I've found myself waiting for saturdays mornings to come with a new block to make. I miss that now. Hope you post another tutorial soon. Thanks!!! What an amazing array of quilts - we all did wonderfully! Very nice eye candy. 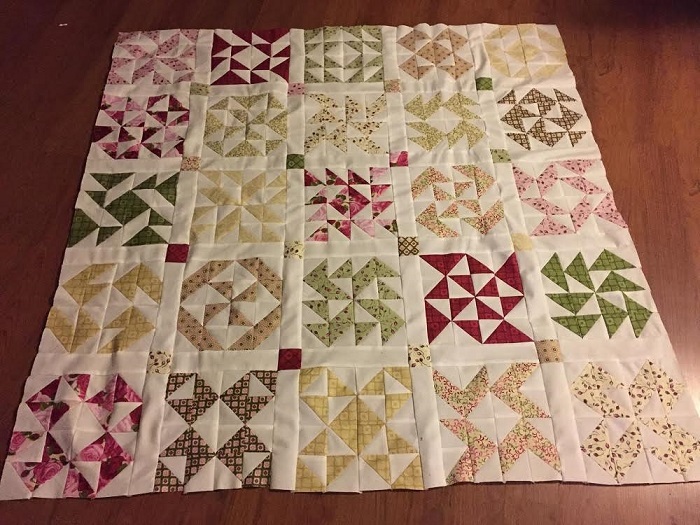 Love to see the differences in the quilts (color, layout, etc.) Great job to all. 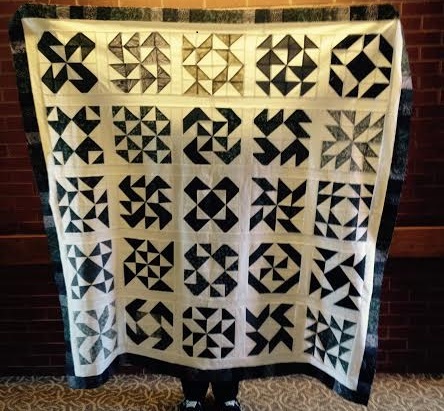 Awesome gallery of quilts!! I love every one of them and can imagine how proud everyone is of their quilt! These are fantastic quilts. Thanks for the great blocks and instuctions. Hope to have mine done soon! Liz, you must really take a bow... Your instructions have been great and look at the results.. I cannot decide which quilt I like best!!! All the same pattern blocks but boy, what a lovely mix of colours in the end. 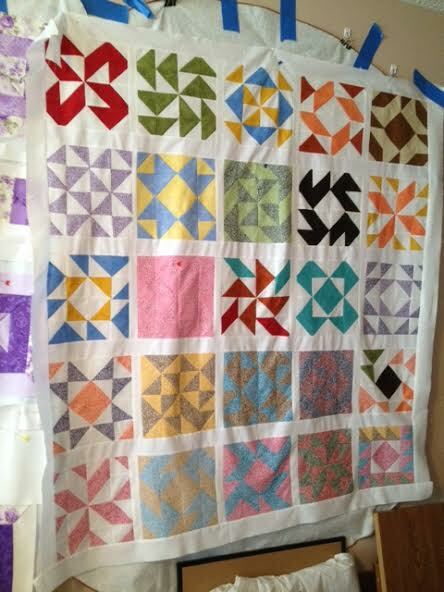 Will try and send you pic of my quilt as soon as I know how to download.Must ask my 11 year old granddaughter for help!!! hehehe. 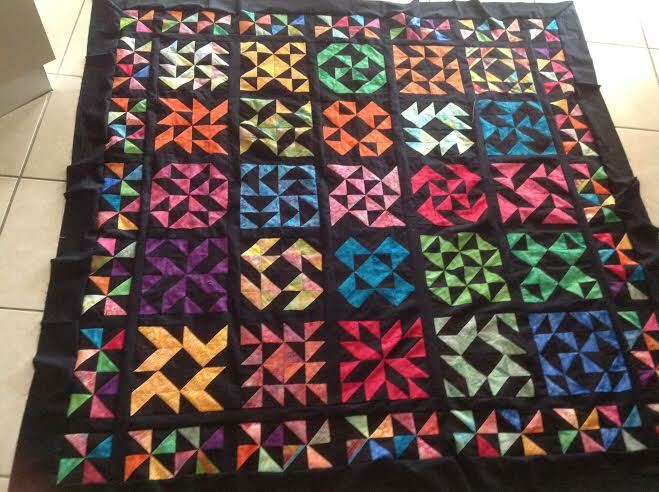 Congratulations to one and all for the lovely quilts. ciao ciao PS Looking forward to another Saturday morning tutorial. Liz, Thank you for putting this pattern online. Wow what art work. I love them. they are so beautiful. So clever! I have some to share myself. I don't have mine totally done yet. Still working on the sashing and finishing up a couple of blocks that didn't turn out as clean as I wanted them to. Thank you so much. Love your tutorials and look forward to more. 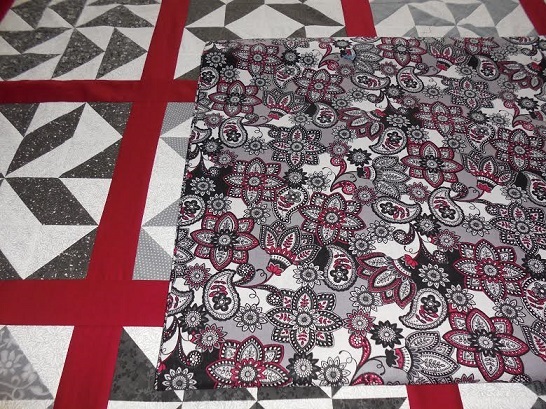 I ironed the first 200 or so of the HST blocks according to Debbie Maddy's video. Then I tried something else, which ended up being much quicker, with virtually NO distortion. I took a block and held it down with the dark triangle up. I then took my fingernail and ran it along the center seam from the center out to the left and the right. I then placed the iron on the block for about 10 seconds. They came out perfect! I believe it worked so well because the seam you are flattening with your fingernail is on the straight grain. Try it! It works very well! 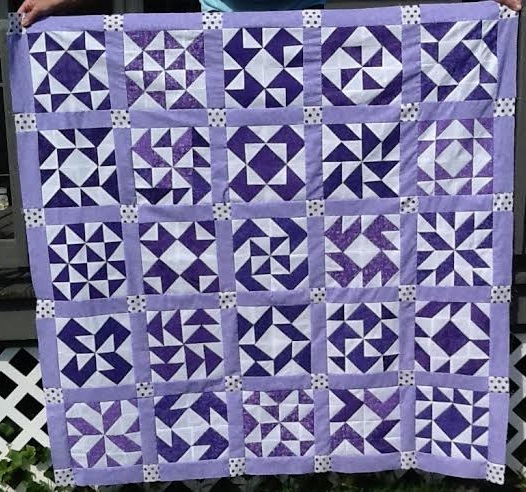 Awesome job on ALL of these beautiful quilts. Love the block designs!! 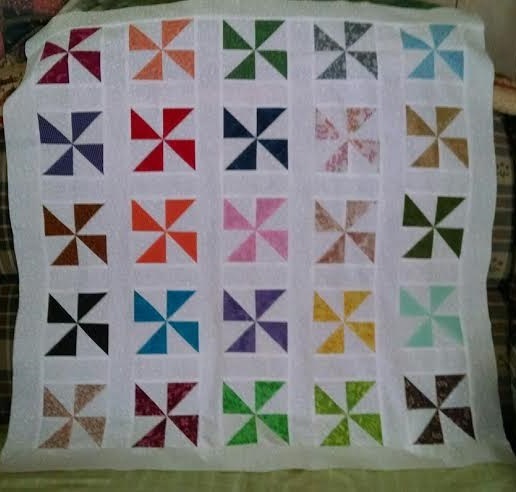 So I am almost done with sewing blocks...14 more to go as I added 24 more blocks to the challenge here.then it's sashing to do..fun. Liz how do I submit pics of the blocks I have done? 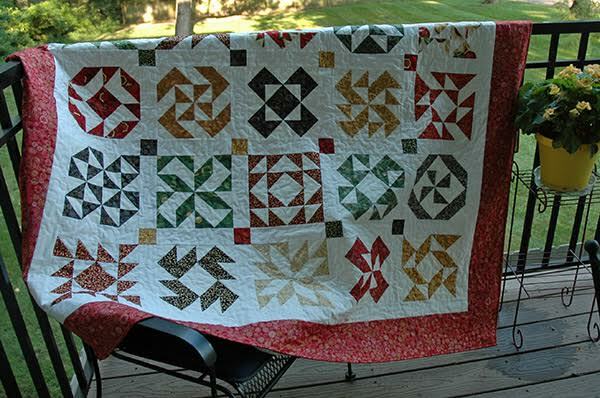 Love this quilt, put would like the pattern called Ronni's D quilt. 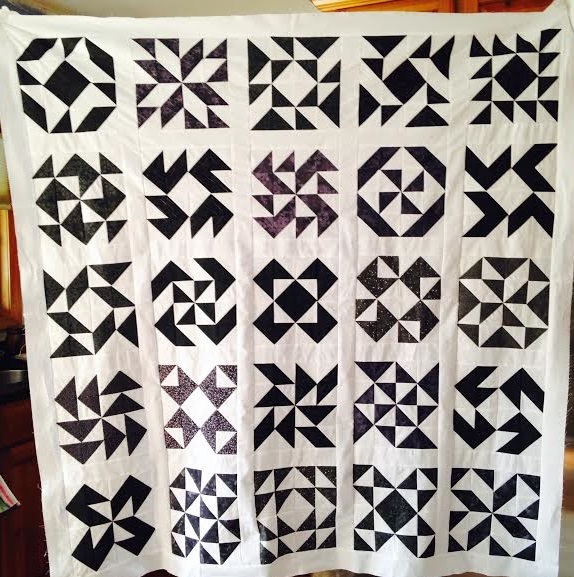 or a quilt that uses black/white and a solid white and a solid black.